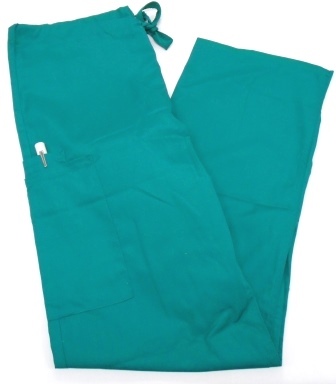 Hunter Green unisex Cherokee Scrub Pants. Drawstring tie. Straight Leg. Two pockets on right leg, one on back. Sioux City, Denison, and Cherokee campuses have scrubs to try on. 65% Polyester, 35% Cotton. Made in Vietnam. Made as Unisex fit and runs large for women. Pen light in the photo is not included with pants. 4X and 5X may be available at the Sioux City campus.